Semi-Powered Order Picker Stacker (200KG)(SPOP-02) - Noveltek Industrial Manufacturing Inc. The order picker can stand in-side of the lift table and control it up and down. The picker can pick the goods at 4.5 meter high (standard). Picking height 5.0 meter and 5.5 meter are optional. 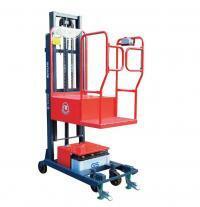 Manually propelled and powered lifting order picker stacker. 2 pieces of brake systems are very safety. The up and down switch is built in the side rail. This light weight stacker is very easy operated and very durable quality. Body width is 750mm it can be used for all aisle. This stacker is very good for the order picker. Total service weight is 247KG it is very easy to push / full. The standard 135AH/12V car battery can be used 1~1.5 years.